As a gift to each other’s 50th birthday my best friend Irene and I decided to spend some time in Cornwall. I quickly found Dacey’s Cornish Tours on the Internet. The tour and David’s (Dacey) comments looked exactly what we were looking for and within a few months a group of 13 people from the US, Canada and us two from Switzerland met our host David and his assistant Harry in London on a Sunday afternoon and got to know each other at a pub dinner nearby. Monday morning we met Tim, our reliable driver for the week. After a few hours on the road we reached our first destination, Port Isaac. Our hotel was on top of a hill and we walked through pastures and cornfields into Port Isaac. It simply took my breath away. 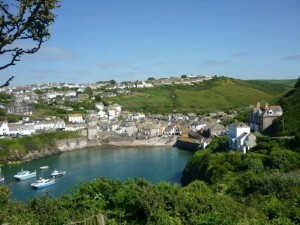 Seeing Port Isaac aka Port Wenn of the series “Doc Martin” I had to rub my eyes to make sure I wasn’t dreaming. The place was even more beautiful than on film. The quaint little houses, the narrow, cobbled streets and the breathtaking view out to the sea – I thought it could not get any better. But it did! Walking up another hill we suddenly stumbled across actor John Marquez we all know as Joe Penhale, Doc Martin’s very own police constable. What a chance encounter! He was ever so friendly and willingly posed for photos (check Dacey’s Cornish Tours on Facebook). What a great story to take home! Walking out to St. Michael’s Mount on Tuesday was another highlight. We waited until the tide was in and got back to shore by boat. There and then we had our first (but not last!) Cornish pasty, a must have in Cornwall. 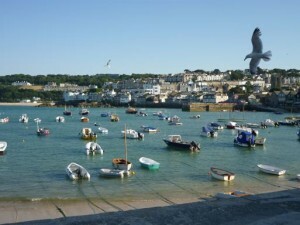 St. Ives was our next destination. I had been there before and could not wait to see this lovely place again. David generously treated the group to a delicious 99 Ice Cream – do try! Walking the streets (beware of the seagulls) and later drinking Sangria in the restaurant opposite The Tate overlooking the beach – that’s what a holiday is all about. Walking back I could not help but have a paddle in the very cold water and collect some sea shells. Wednesday we spent again in St. Ives, wandering around and about, going up to the Island Chapel. Sadly the foggy weather did not offer a view over the beaches – but created a very mysterious and special atmosphere. In the afternoon we drove to Land’s End. I had been there twice before in recent years but never for long – big mistake! David kindly took us on a walk over the hilltops and showed us views and places I had never seen before. The rough coast, the sound of breaking water, the glittering sea – stunning! Later we got the chance for a paddle in the sea at Porthcurno beach. Feeling the warm sand under your feet and stepping into the cool water was simply blissful. Finally, a personal dream came true – seeing a play at the Minack Theatre. The setting and the evening was simply heavenly – sitting there on a rented seat (the best spent pound in Cornwall as David recommended – and he was right), looking out to the sea and the almost full moon, and the farce The Magnificent Three – how much better can it get?!! This was the icing on the cake of a perfect Cornish day. Thursday morning we were greeted by rain, the only time on this trip. We first visited Truro, Cornwall’s only true city. Arriving at The Lost Gardens of Heligan our driver Tim, a former ranger, offered to take us on a tour around the gardens. And then the place turned into The Lost People of Heligan. We were 11 people following Tim and suddenly at a crossing there were only 5 of us left. We looked around and around but could not see any of the others nor Tim … We walked on towards The Jungle and again suddenly there were only 3 of us left … Was this another chapter in Agatha Christie’s “And then there were none” or were there any flesh-eating plants around? We walked on and on deeper into the jungle – and were finally rescued by David taking us back to the others. Later we were off to The Eden Project a place that looked like something out of Star Wars – a jewel for garden lovers and everybody else. Friday morning Harry proudly presented us his beautiful, picturesque hometown Fowey (pronounced totally differ­ently, ask the locals). We then went on to Lanhydrock, a 17th century home with magnificent gardens. We then sadly had to leave Cornwall and reached Devon’s capital, Exeter, late afternoon where the whole group and our very own Magnificent Three, David, Harry and Tim, met for a final dinner together at our hotel’s exquisite Italian restaurant “The Olive Tree”. Saturday we had our last English breakfast and we eagerly waited for David to appear as it was his birthday. A little speech was made (thank you, Rod) and a card with some friendly words and new shoe laces for his hikes were presented to David. Hope they come to good use! We sadly had to say goodbye to Harry, David’s reliable assistant, as he was leaving for home. After a few hours we reached London and made our farewells to the whole group and to David and Tim. I cannot thank David, Harry and Tim enough for giving us the most wonderful time in Cornwall. The main reason that made this trip so memorable and special is not just the places we saw – but their love and pride for Cornwall that they wanted to share with us. They always had a smile on their face and a kind word for everyone. The tour was put together with love and great care. It was the perfect balance of group time and individual time – there was never a MUST but always a CAN. I can recommend Dacey’s Cornish Tours without reservation – if you want a true Cornish experience that is the way to do it. There was only one big mistake – the tour did not last long enough – I could easily have done with another week!! When saying goodbye to Cornwall leaves you with a tear in your eye and an ache in your heart then truly Dacey’s Cornish Tours did everything right. You have infected me with the Cornish virus. I’ll be back! What a lovely story. You made me tear up a little. I am anxiously waiting for my time in Cornwall in September. Thank you so much for sharing. LeAnn, you are so lucky to go in September. You are in for such a treat. I wish I could join again. I just wrote what I felt. Reading it made me tear up again, as well. You are bringing back some fantastic memories.I was on Daceys Cornish Tours in 2013.This is the best way to visit Cornwall with DCT. I really mean what I say, you are a good writer! And I must add how kind and patient David has been with me. I have never visited overseas before and some of my many questions have most likely been exasperating but every question has been answered to my complete satisfaction. A beautiful summary of a delightful tour. We enjoyed every minute of touring Cornwall with David, Harry, and Tim in April. Fond memories of meeting delightful people and enjoying the beauty of Cornwall. Beautiful tribute. I went on this tour last September, and absolutely loved it. Not only is Cornwall one of the most beautiful places on earth, all three tour guides were delightful. Like Isabel, I was sorry when the week was over. Thanks, Isabel, for the memories. Dear Hannette, pleased it brought back some memories. I’ll treasure mine, wish I was there again. Dear Hannette, glad I brought back some memories – mine are still very vivid. I believe that I was on the tour just before you and we had the same wonderful experience. I really enjoyed reading your story; although I think about the trip often, it was nice to have it all brought back in one lovely sum-up. Thanks! Dear Eve, glad to bring back memories. Looking at my photos I wish I were there again. Loved your storey Isabel. We will be joining David in September and hope we enjoy it as much as you. Oh Denise, you are in for such a treat. 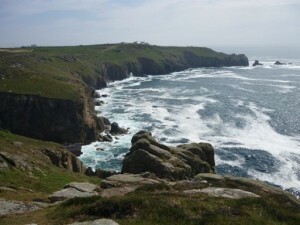 Cornwall is simply magnificent and your 3 guides David, Harry and Tim are just so kind and fun to be with. Have a wonderful time!! What a perfect summary of our marvelous memory. Thank you Isabel! Thank you, Rod, for your kind words. Say hello to Karen. You’re right – it was quite funny getting lost in the Lost Gardens of Heligan. I guess by now we would be starving hadn’t we been rescued. On the other hand we would still be in Cornwall …. Dear Julie, I guess it was just as good in 2013 as it was in 2015. DCT truly is the best and the only way to do it if you want to thoroughly enjoy yourself without any hassle. Hi Julie, glad to bring back memories of your tour 2013. 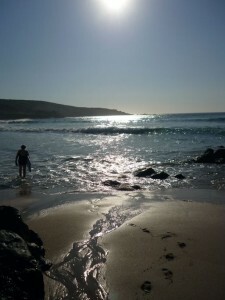 And I agree, DCT is the best way to see Cornwall – perhaps the only truly Cornish way.